The simulation shows the interface between a sunspot's umbra (dark center) and penumbra (outer region) shows a complex structure with narrow, almost horizontal (lighter to white) filaments embedded in a background with more vertical (darker to black) magnetic field. The innerworkings of sunspots ?those dark blotches that mark intense magnetic activityon the sun's surface ? have long been a mystery, but a new computer simulationis providing a more realistic look inside them. Understandingthe complex dynamics that drive sunspots could help scientists betterunderstand and predict the potential impacts oncommunications systems and climate patterns of the geomagnetic storms producedby these solar blights. 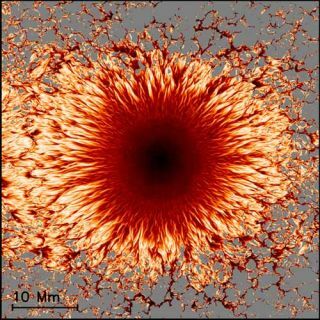 "Thisis the first time we have a model of an entire sunspot," said one of thescientists who helped create the simulation, Matthias Rempel of the NationalCenter for Atmospheric Research (NCAR) in Boulder, Colo. "If you want tounderstand all the drivers of Earth's atmospheric system, you have tounderstand how sunspots emerge and evolve." Sunspotsare areas where intense magnetic activity acts like a cap on the roilingmaterial below. These splotches appear darker than the surrounding surfacebecause they are cooler ? around 7,000 degrees Fahrenheit (4,000 Celsius)versus 10,000 F (5,500 C). Solar flaresand coronal mass ejections are typically found in magnetically active regionsaround groupings of sunspots. These plasmastorms can buffet the Earth's atmosphere and disrupt power grids,satellites and other systems. Sunspotactivity peaks and wanes on a roughly 11-year cycle. That cycle is currentlyin its low period, so there now are few sunspots and little solar activity. The newmodel simulates an area on the sun of about 31,000 by 62,000 miles (50,000 by100,000 km) and 3,700 miles (6,000 km) in depth; within this area, thesimulation captures pairs of sunspots with opposite magnetic polarity. Themodel reveals the details of the dark central region, or umbra, as wellas the narrow filaments of mass that stream away from the spots in the outer,or penumbral, regions of the sunspot. Thesimulations suggest that the magnetic fields within the sunspots need to beinclined in certain directions to create these complex structures. Rempel andhis colleagues think that sunspot features can be explained as a consequence ofconvection in a magnetic field. "Withthis breakthrough simulation, an overall comprehensive physical picture isemerging for everything that observers have associated with the appearance,formation, dynamics and the decay of sunspots on the sun's surface," saidMichael Knoelker, also of NCAR. The modelwas run on NCAR's new bluefire supercomputer ?and verified with thedetailed observations made by ground- and space-based telescopes. Theresearch, detailed in the June 19 online issue of the journal Science,was funded by the National Science Foundation.